I have a vivid childhood memory of attempting to make a flower crown out of dandelions. The idea of putting flowers in my hair was the coolest thing ever. The problem with dandelions is that the weedy glue like juices (getting technical here) that drip out of the stem stain. I remember things taking a turn for the worse when my grandmother got mad at me for completely ruining my white shirt. Flower crown fail. As I have been focusing on pulling together my bridal look, the one thing I am continuously drawn to is flower crowns (big surprise there I'm sure). I have this weird pull to them and extreme admiration. I also had another sense of apprehension and uncertainty over whether a flower crown was the right choice for me on our wedding day. If I'm being completely honest, I had this fear that I couldn't pull it off. Mr. Narwhal doesn't know whether or not I will have one; however, has predicted that I will. So, that apprehension eventually led to the decision to let go and just commit to it. I knew that if I didn't go for it, I would always wonder "what if" and regret my decision to play it safe. So, flower crown it is, and inspiration was needed. There are so many different beautiful options out there, so indulge me while I share some of my favourite bridal eye candy. So much beauty. While you still need to wait awhile before I share what we're doing for our flowers, the flower crown will definitely be in the mix. 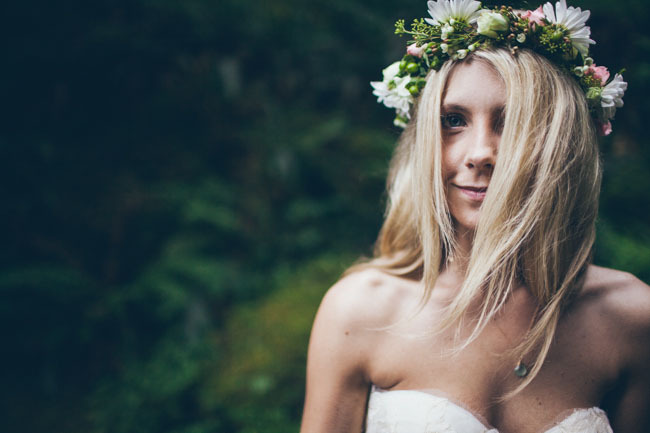 What are your thoughts on flower crowns?